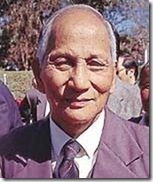 Aizawl, Jul 26 : At the ripe ‘young’ age of 91 years Brigadier (retd) Thenphunga Sailo, twice Chief Minister, and current member of the Mizoram Assembly (MLA), announced his intention to retire from active politics when this term of the Assembly ends. He is probably the oldest legislator in the country or even globally. He made this announcement today in the Assembly which incidentally is the last session for this term which ends in November this year. He said that he would not contest the next elections bidding farewell to the House in which he had played a prominent part in the State’s political history since 1977 in his checkered career as an MLA. His die-hard fans still regard him as the toughest Chief Minister the State had and they wish he had been younger, in which case he would have won hands down at this moment of political flux. He began his political career in 1974 after retiring from the Indian Army. He rocketed to prominence when he took up his former employer’s excesses in countering insurgency in Mizoram, particularly the bombing of the State capital and other areas by the Indian Air Force (IAF) setting up a Human Rights Committee then. Everyone is going to miss him, is the general comment all round.